Need a Spring Replacement ASAP? Cheapest price for quality products in Brisbane guaranteed! Do not attempt to replace garage door springs yourself. Garage Door Spring Replacement is a Dangerous procedure requiring a highly trained technician. The process may look easy enough on DIY YouTube videos, please be aware these videos do not mention the high injury risks! 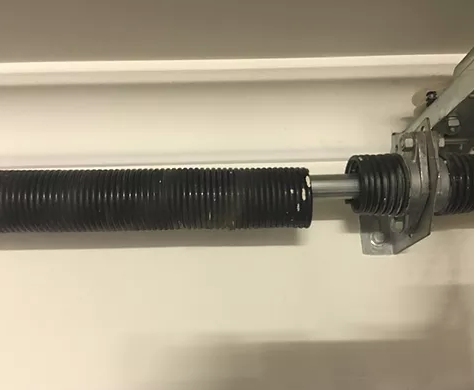 Garage Door Springs are wound with high tension and can cause serious & costly damage to your home & garage door & can also cause serious injury to yourself or anyone else around. Do not attempt to open your garage door if you have broken springs. When using your automatic opener to open your garage door whilst you have broken springs is putting unnecessary strain on your electric opener. Lifting a dead weight of up to 120kgs with your automatic opener with broken garage door springs may potentially burn out the internal motor costing you more money to replace / repair. Always leave the job to professionals. IS YOUR GARAGE DOOR NOT WORKING? HAS YOUR GARAGE DOOR GOT BROKEN TORSION SPRINGS? Most garage doors are used several times a day. When quality garage door springs are installed, they usually hold a life cycle of approx. 20,000 cycles. Our qualified technicians can replace your broken garage door springs quickly giving you access & security of your garage door. Our vehicles are is fully equipped & stocked with a range of springs to suit every sectional panel door ensuring your garage door is repaired immediately with less down time. We offer a 100% satisfaction guarantee. Bouncing – Does your garage door bounce? Call Brisbane Roller Doors for all Garage Door Spring Replacements. Garage Door Spring Replacement – Is your garage door not opening? You could have broken torsion springs. Torsion springs are a designed to last x amount of cycles, After which they break which usually makes a loud twang noise. Your sectional panel door will be very hard to open, if it will open at all. * See note below. Of course, your garage door only ever breaks at the most inconvenient of times, usually either locking you out of your garage / house or locking your car in your garage. 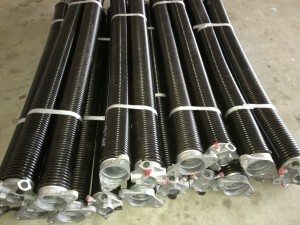 We carry the most general of size torsion springs to suit most Sectional Panel Doors in our vehicles at all times enabling us to repair your garage door immediately saving you down time and money. Our service technicians will always replace both torsion springs unlike some other door companies who will only replace both yet tell you they have and still charge you for a pair. BRD technicians take pride in providing a fair, honest and reliable service & products and always treat your garage door as if it were their own.